Emmanuel Macron is seeking to lay out a road map for the future of the European Union. The French president wants to make a name for himself as the savior of Europe but he cannot do it alone, says DW's Barbara Wesel. Somebody wants to be the new king of Europe. One thing's for sure: The French president certainly knows how to talk the talk. Many EU doubters will surely be reconsidering their views after Macron's great speech on the history and future of the united continent. German Chancellor Angela Merkel has never given such a speech in all her political life – big rhetorical flourishes aren't her thing. Macron, on the other hand, believes in the power of words – that is, after all, how he, the staunch European, won the French election. En Marche – but where? Macron doesn't just want to get France moving. With his speech at the Sorbonne in Paris he also delivered a detailed road map for the future of the whole of Europe. In doing so, he took great care to ensure there was something in it for everyone he was addressing. The passages on the need to further strengthen social protection and solidarity were aimed at the people of France. His assertion that the European countries had to work together to guard the borders of Europe effectively and limit migration were intended to counter xenophobia. He wants to restore a common policy on asylum, and on asylum-seekers whose claims have been rejected. In this regard, no detail is too small: The president knows that these are precisely the fears that fan the flames of right-wing extremism. On that topic, with an eye on the German elections, he said, "I never thought the past would return." In some respects, his outline has the character of a political grab bag: It features almost every reform that has been proposed and discussed in Europe in recent years. For example, the joint defense force that, since Brexit, has suddenly become a possibility, and the basics of which should be decided by Christmas. Let's exchange soldiers and absorb them into our respective militaries, the French president said. It was a skillful mixture of big reform plans and small steps capable of conveying a sense of success. He praised the idea of a digital tax – currently the subject of heated debate among EU finance ministers – to be paid in future by the big internet companies in the country where their profits are generated. Macron wants a European agency for innovation; he wants to shape the digital future, to open up the energy market, to protect agriculture and food security – no good and useful project generally endorsed in Europe but hung up by the details was left out. Part of Macron's blueprint for the future was directed at Berlin. He congratulated Merkel on her victory, while knowing that after last Sunday's election he too has grown weaker in Europe, along with her. The French president had words of support for the chancellor in the struggle against right-wing extremists; he is, after all, familiar with the fight against nationalists, after his own experience with the National Front. 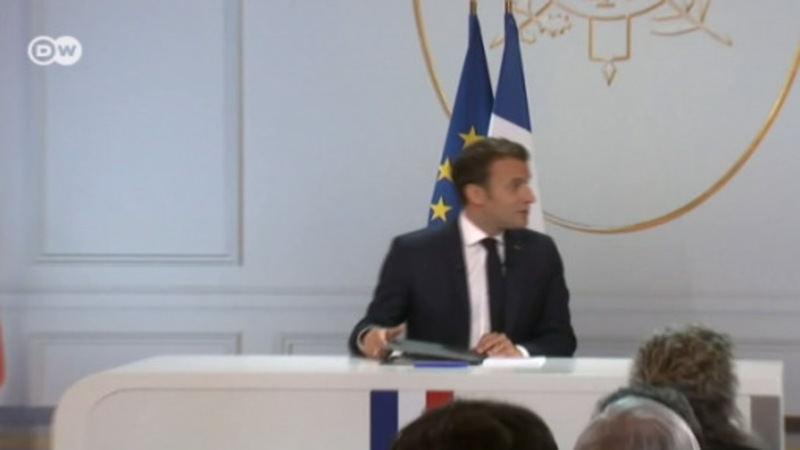 Then, almost as an aside, Macron also spoke about the eurozone. A common budget was needed, he said, to keep economic shocks at bay, and this should initially be funded by the new digital tax. And yes, he also wants a minister responsible for supervising the common currency area. The president also realizes, of course, that there is not a great deal of progress to be made on this with the business-friendly Free Democrats (FDP) forming part of a coalition government in Berlin. On the other hand, the election is over, and for its part the FDP also knows it must reach out to Macron so that he can have at least a limited degree of success. Because if he fails, the free-market liberals won't have much to defend any more, either. Macron, the king of Europe? The Paris speech was cleverly structured. The actual, contentious points went almost unnoticed amid the plethora of reform plans. There will be progress on some issues: defense, border security, counter-terrorism and so on. So Macron won't end up empty-handed, a loser, even if only some of his proposals make it through the mills of European politics. But will the president take over Merkel's leadership role on the continent? Not really, because he knows he needs her experience and her talent for practical politics, compromise and solutions. Without the chancellor he doesn't stand much of a chance: The two of them can only retain some degree of strength in Europe if they stand together. But Macron has what Merkel lacks: the ability to invoke sovereignty, unity and democracy in Europe in such a way that people listen. He is at least looking for a plan when it comes to shaping the future of Europe.